Have you ever heard the classic, old-school marketing line: “Half the money I spend on advertising is wasted; the trouble is I don’t know which half”? That’s how it used to be for marketers, and still is for traditional marketers. They pay a premium up front to print and broadcast media to blanket an area with messages about their products and services, and even if they are successful, can’t pinpoint which channel was most effective. The internet and digital advertising have changed all that. Now, you can put your messages in front of potential customers at the very moment they are searching the internet for the things you offer. And you’ll know with a high level of detail what is working and what isn’t, allowing you to refine your efforts and calculate your return on investment. 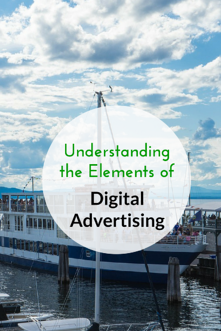 Here are the elements of digital advertising you need to know to get started. Google’s pay-per-click advertising service - Adwords - is based on your message and contact information appearing at the top of search results pages when people type in searches for the kind of product or service you offer. Every time someone clicks on your ad, Google charges you. The amount they charge is based on a bidding system that defines what you and competing businesses are willing to pay for certain keywords or phrases in a geographic area. As an example, the cost of bidding on the phrase “lawn mower” would be less competitive and have a lower bid in New York City where there isn’t a big call for lawn mowers while the same phrase would have a much higher rate in the suburbs where their is greater demand and higher bid price. Finding the right amount to bid is an art that you will improve on as you get more experience. If you submit an amount, run the campaign and find that your ad is not appearing as frequently as you would like, then a competitor has most likely outbid you for the phrase; they are paying more per click. You can up your bid to increase the number of times your ad is shown. But be careful not to overbid. Manage your budget. You may outbid your competitors - and your ad will appear more frequently - but you also may blow through your ad budget quicker than you would like. Set an overall Adwords budget and determine which keywords are worth the most spend. Give yourself some leeway for trial and error when honing in on the optimal bid per keyword. If you know how many of the prospects who visit your web page convert into customers and the average value of a customer to your company, then you can calculate your return on your digital advertising investment. Let’s say a new customer brings in an average of $100 to your company, and you are converting about one in every ten website visitors into customers. Now let’s say you are paying $1 per click on a particular keyword. If 100 people click on your ad, then you have paid $100. If you convert ten of them into customers, you have made $1,000. You’ve made ten times what you’ve spent. Another benefit of digital advertising compared to traditional advertising is the bounty of data you receive about who is engaging with your ad. You’ll know the type of device they used to click on it (e.g. mobile device or laptop), their geographic location, and the time of day they clicked, among other things. There is a host of data points in your reports you can use to tweak existing campaigns and inform future campaigns. People are constantly searching the web for products and services just like yours. Take advantage of digital advertising to put your business’ calls-to-action in front of them at just the right time. Breezy Hill Marketing is a Vermont web design company offering digital advertising strategy, inbound marketing, and social media marketing for clients throughout the United States. We work closely with our clients to craft strategies specific to their needs.